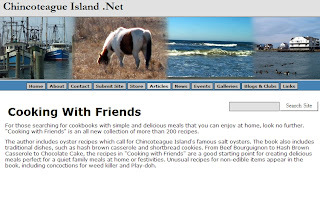 Check out chincoteague-island.net to read their article on my cookbook, Cooking With Friends. The folks at chincoteague-island.net did a fine job capturing the true essence of Cooking With Friends. In addition they have also provided an easy, one click link on their site for patrons to purchase the book. Being originally from the Eastern Shore of Delmarva, where chincoteague-island.net is located, I am especially honored to have Cooking With Friends reviewed on their site. In fact, in one of the recipes in Cooking With Friends states that only fresh oysters from Chincoteague should be used in the dish. Their sister site, http://www.fresh-seafood.net/ also includes a one click link to purchase Cooking With Friends. So head on over to http://www.chincoteague-island.net/ and http://www.fresh-seafood.net/ to not only read the article but also to check out what an awesome site they have.